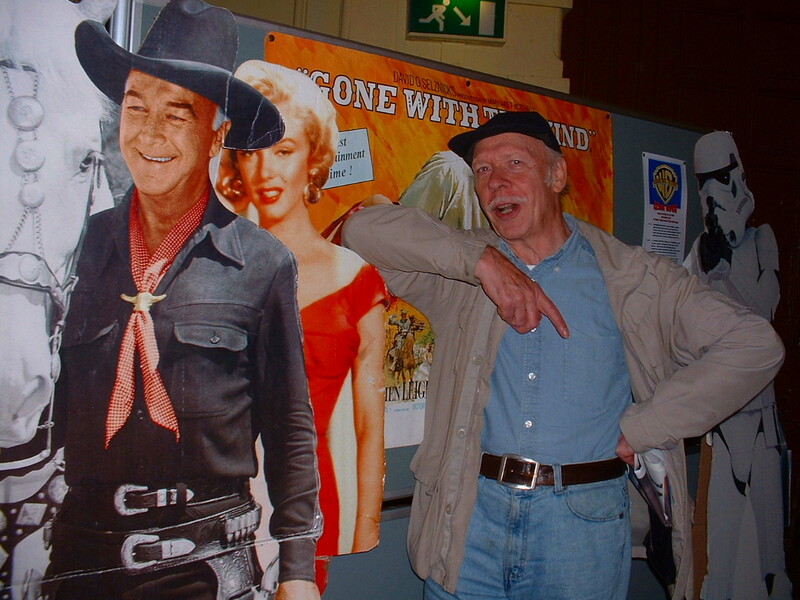 The BFCC's patron Brian Murphy with Marilyn Monroe. This is quite a large file so viewing is only recommended for those with a fast video connection. Doug Meltzer from New York made his second visit to the BFCC and being a professional cameraman shot shot and edited this rather impressive video which has been made available on the web by Brad Miller who runs the exceptional 8mm Forum. The full programme can be seen by clicking on the two thumbnails below, but if you prefer the following is a short summary of the shows offered during the day. 1) Politically Incorrect Saturday Morning Show including the new release "Wallace and Gromit - A Grand Day Out". 3) "The Man Behind the Shield" - The film scores of MAX STEINER. 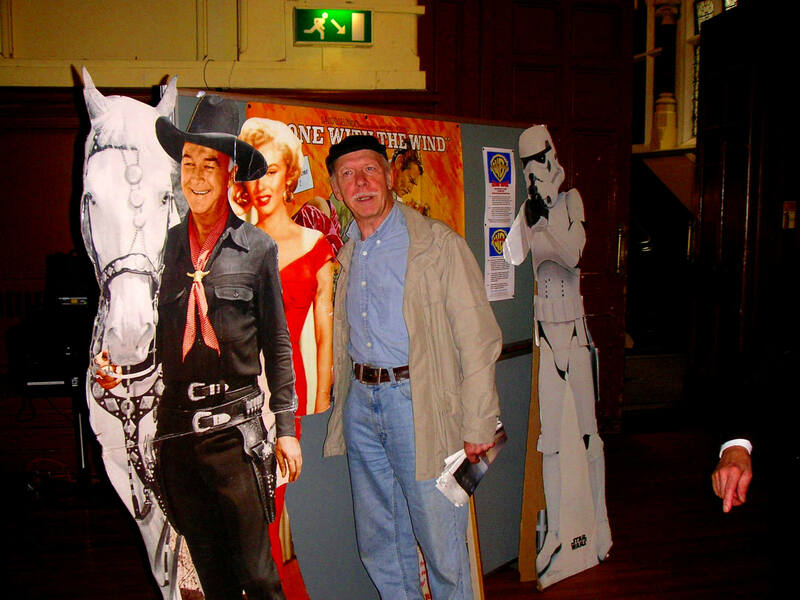 Ken Locke and Keith Wilton presented an illustrated lecture with a host of film clips. 4) The 'Scope show with a DTS (Digital Theatre System) sync' pulse show of the opening sequence from 'Gladiator' (available from Derann). 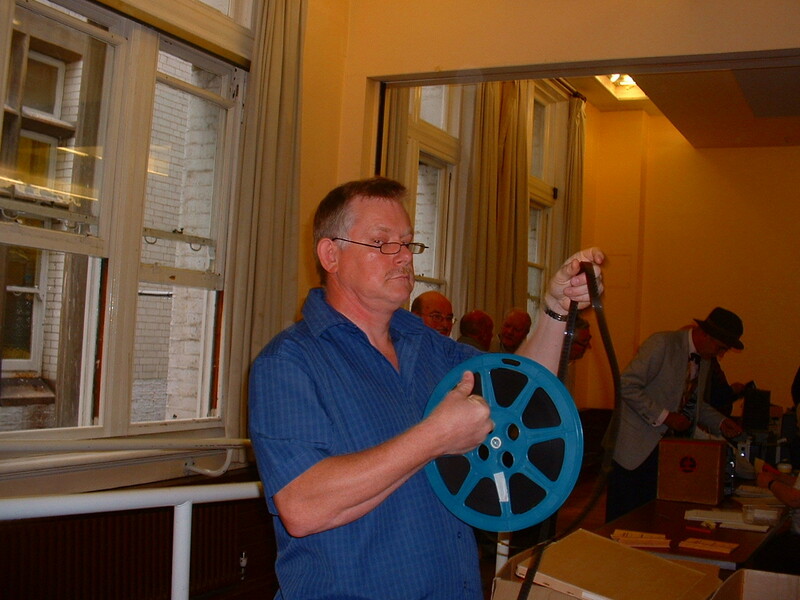 Super 8 DTS has never been demonstrated before at any UK convention and it was chosen for this event to follow on from the Vitaphone show earlier in the day. Sound on disc has been around since the dawn of the talkie as today's convention illustrated. 5) "CINEMA RETRO 70" - Super 8 cut-downs, trailers and adverts from the 70's. 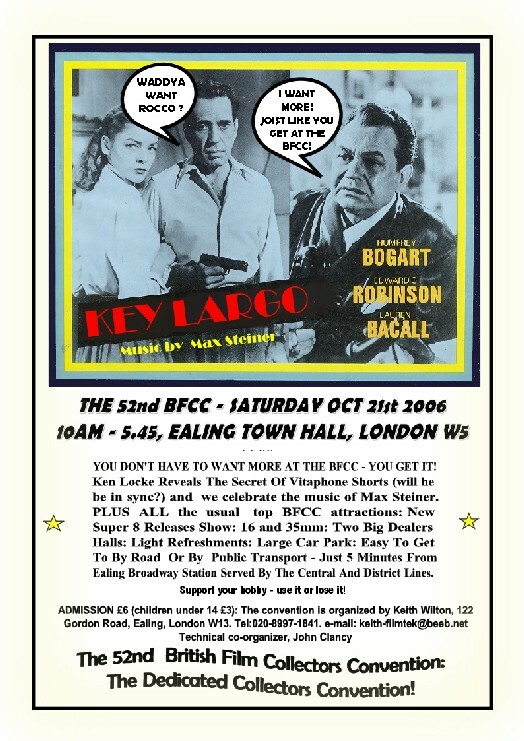 In conjunction with Dave Worrall's fabulous 'Cinema Retro' magazine. Plus all the usual BFCC attractions including two dealers rooms and the ever popular bring and buy. 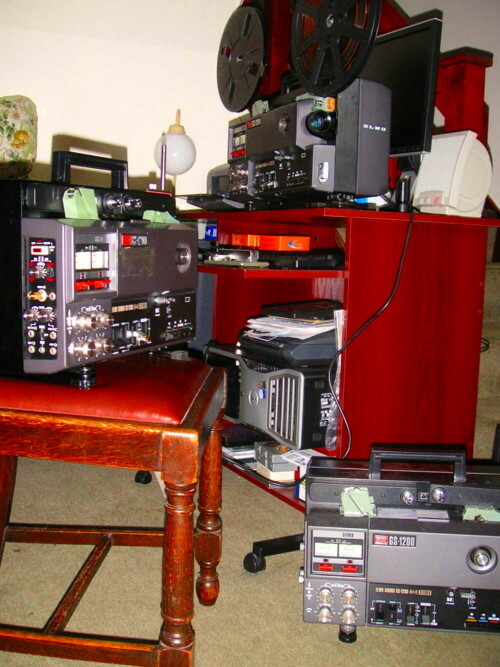 John Clancy's collection of GS-1200's used in the assembly of the 'Cinema Retro' show. The shows have to be assembled, checked, cleaned and double checked. The final check was done on the HTI converted machine as used at the convention. "I came all the way from America to show you how to focus the Elmo GS-1200 Keith!" Shortly before the convention our agent from Florida visited to assist with work at Ealing's secret bunker. 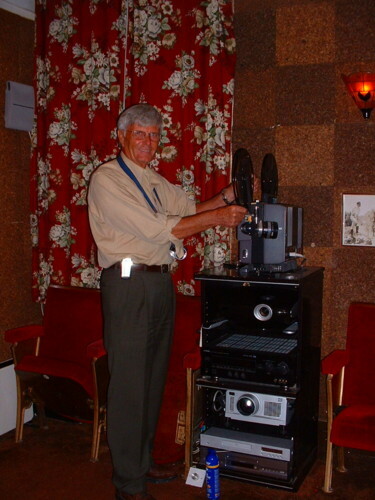 Paul Adsett in Keith Wilton's Cinema 1 prior to the big day. 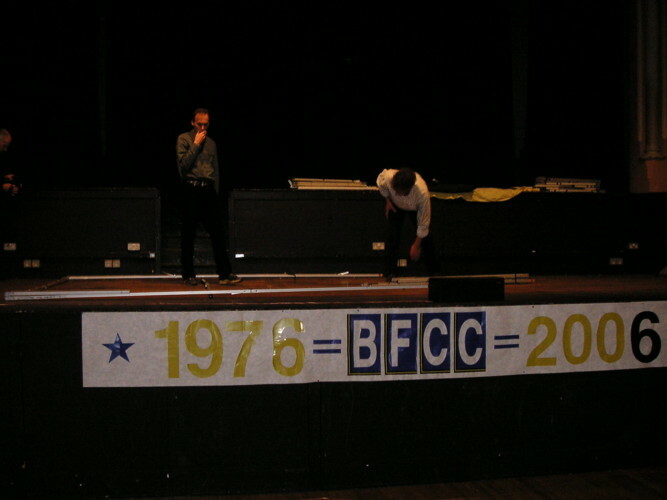 30 great years of the BFCC. The hand bill distributed to promote this convention. 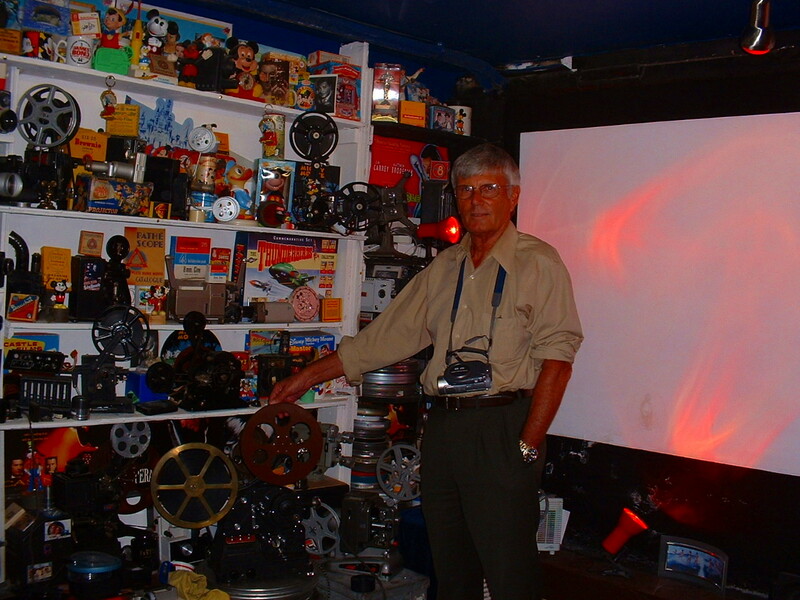 David Locke caught on camera performing the film collectors 'ritual'! 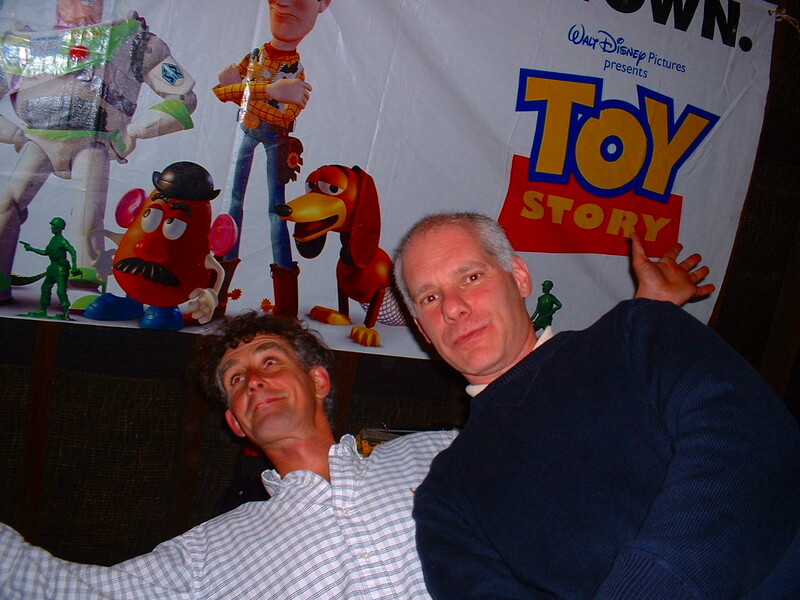 Tim Poole with Doug Meltzer from New York City who flew over for his second BFCC.